Newport Beach, California: Books On Tape, 1997. 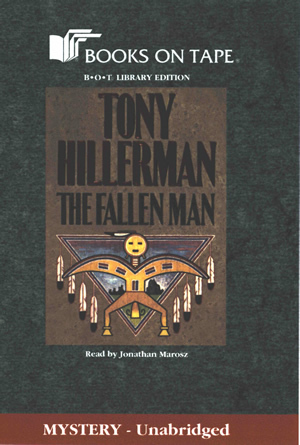 This is the Books On Tape unabridged library edition audiobook of The Fallen Man by Tony Hillerman. The book is read by Jonathan Marosz onto 7 cassette tapes of 1 hour each, for a total listening time of 7 hours. The cassettes are in a white hard plastic case with a cover insert. The cover has a wraparound gray faux stone background. The book title and author are printed on the front cover of the case. The cover is illustrated with the first edition cover art by Peter Thorpe featuring a representation of a Navajo Yei figure in front of an upside down triangle with feathers hanging from the sides. Inside the triangle are three sandstone formations on one side of the Yei figure and Ship Rock mountain on the other side, below a sky with clouds and New Mexico sunset coloration at the top. On the back of the case is a synopsis of the novel and publisher information.